2. High performance is guaranteed with the integrated circuit plate. 3. The linear guide of the cutting plotters ensures high speed and few errors. 4. The cutting plotters feature imported digital servo drivers and their SD cards offer mass storage. 5. The powerful compatible function enables connection with any kind of CAD software. 6. 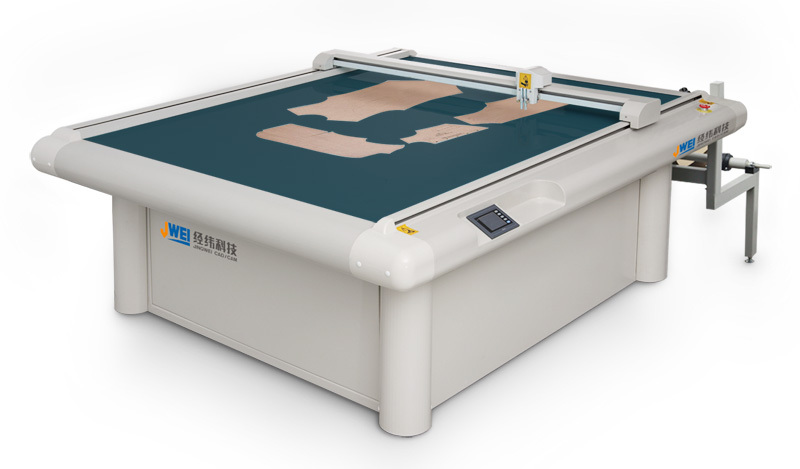 The cutting plotters have an LCD touch screen in both English and Chinese. 7. The cutting plotters feature intellective order printing. The EDO-1863A and EDO-1873A cutting plotters are used in image symbolization and the clothing, suitcase, trimming and padding industries. rubber sheet and marking film etc. JINGWEI is cutting plotter manufacturer, based in China. We offer cutting plotters, sample makers and cutting machines. We provide high quality products at competitive prices. Our company can supply the full chain of manufacturing plastic cutters and flatbed cutting plotters right here in China. Our lower manufacturing cost saves your purchasing cost. More details of each product are shown on the description page.